The capital has a total area of 6,079 squre kilometers, four districts, five banners and counties, and a population of 1.445 million, among whom 180,000 are minority people, 11 percent of whom are Monoglians. 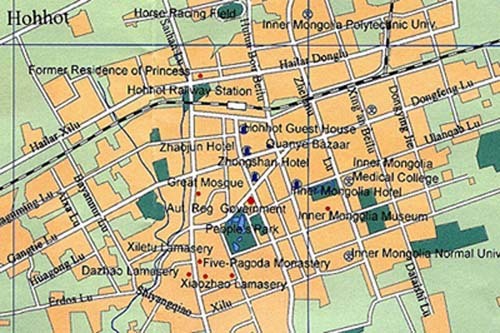 Downtown Hohhot covers an area of 60 square kilometers, with a population of some 800,000. Today it is the most important city in Inner Mongolia and is home to 36 different ethnic groups. Notable among these are Mongolian, Han (hàn zú 汉族), Manchu (mǎn zú 满族), Hui (huí zú 回族), Tibetan, Daur (dá wò ěr zú 达斡尔族), Oroqen (è lún chūn zú 鄂伦春族), Ewenki (è wēn kè zú 鄂温克族) and Korean, etc. Hohhot is an ideal place to relax thanks to the magnificent natural beauty of the Gegentala and Xilamuren Grasslands as well as fantastic cultural sites such as the Dazhao Temple, Five-Pagoda Temple and the Xilitu Zhao. Mongolian folk songs and wrestling are popular entertainments while ethnic delicacies and the clemency of the local people add to the enjoyment of a stay here. Travelers can enjoy a wide variety of activities including horse riding, or maybe visiting the home of a herdsman's family or roaming over the vast grassland and of course there is the thrilling Nadam Fair. Hohhot has a mid-temperate continental and monsoonal climate. It has long winter and short summer. So it is an ideal summer retreat. The temperatures in Hohhot during day and night vary considerably. The rainfall is scare here with an average of 335-534 mm annually. Paleolithic relic excavated in Dayao village (dà yáo cūn 大窑村) close to Hohhot indicates that there were people in this region about 550,000 years ago. The Paleolithic relic (a site of stone ware making) is unique in the world. In 300 BC, the state of Zhao (zhào 赵) occupied the northern part of Hohhot. In 306 BC, Lingwang (líng wáng 灵王), the king of the Zhao, named this area Yunzhong (yún zhōng 云中) and constructed a section of wall (a section of the Great Wall) along the Yinshan Mountains (yīn shān 阴山) to protect it. Yunzhong served as an administrative center during the Qin (qín 秦) (221 BC-207 BC) and Han (hàn 汉) (206 BC-220 AD) dynasties. In early 16th century, a Mongol troop, under the leadership of Alatan Khan, marched into this area. 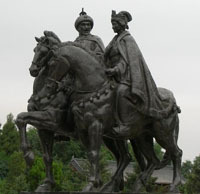 Alatan Khan (ā lā tǎn hán 阿拉坦汗), and his wife, Sanniangzi (sān niáng zǐ 三娘子), started to establish a town here in 1581 and named it Hohhot that means ‘green city’ in Mongolian. The town was also called 'Sanniangzi'. Later on the Ming (míng 明) government renamed it Guihua (guī huà 归化). In 1735 (Qing Dynasty), Manchus built a town about 2.5 kilometers northeast of the city of Guihua and named it Suiyuan (suí yuǎn 绥远), which is the modern city of Hohhot. 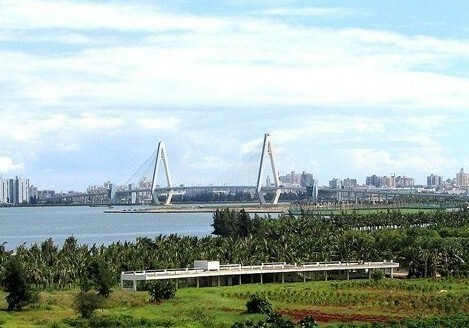 After the Qing Dynasty, the city was called Guisui or Houhe (hòu hé 厚和) till November 1949 when it was liberated. The city was called Hohhot again. As a tourist resort, Hohhot has a modern reliable transport network, excellent hotels and large shopping centers. The city brings together specialties from all over Inner Mongolia, ranging from Mongolian silverwares, carpets, cashmere, camel hair products, traditional knives, decorative deer antlers, narrow-leaved oleaster curtain, oatmeal and various dairy products to fancy Mongolian costumes. 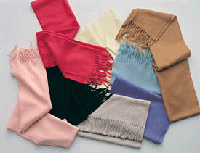 These products can be bought at both fair and market, whilst special products can be bought from shopping centers. If you are interested in handicrafts such as calligraphy, chinaware, jade ware, bamboo, and woodcarvings, Inner Mongolia Antique Shop on Xilin North Road (xī lín běi lù 西林北路) may give you some surprises. 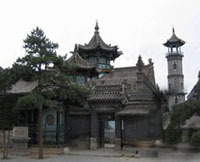 Dazhao Temple is the oldest and largest temple in Hohhot. It is located in the old part of Hohhot and was built in 1580 during Ming Dynasty. Usually, the locals call it Yinfo Temple (yín fó sì 银佛寺) (Silver Buddha Temple) because there is a rare silver statue of Sakyamuni (the founder of Buddhism) with 2.5-meter-high. Splendid statues, delicate frescos, and great collection of Buddhist scriptures, these are the major features of the temple. Surrounded by green grasses and towering ancient trees, Zhaojun Tomb is situated nine kilometers south of Hohhot. Standing on the top of the tomb, you can obtain a fabulous view of the vast plains and rolling Yinshan Mountains undulating into the distance. It is listed as one of top eight popular scenic spots in Hohhot. It is also called "Green Mound" because it is surrounded by fresh and green grass. The Great Mosque, located in the older southwestern part of Hohhot, was built during the reign of Emperor Kangxi (kāng xī 康熙) of the Qing Dynasty (qīng cháo 清朝) (1644-1911 AD) after throngs of the Hui Muslim Minority migrated from Xinjiang (xīn jiāng 新疆) to Mongolia. The mosque is a strange mix of Chinese and Arabic architecture, that is interesting not only for its insides, with its active worship, but also for the atmosphere that this whole area presents. 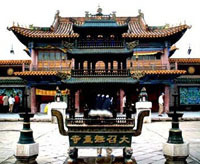 Xilitu Zhao, also called Xiaozhao Temple (xiǎo zhào sì 小召寺), is situated in Stone Lane (shí tóu xiàng 石头巷), Yuquan District (yù quán qū 玉泉区), Hohhot City. It is about 100 meters (328 feet) away from the famous Dazhao Temple (dà zhào sì 大召寺). Xilitu Zhao is a key cultural protection unit of Inner Mongolia Autonomous Region. The Five Pagoda Temple, also called Jingangzuo Dagoba (jīn gāng zuò shè lì bǎo tǎ 金刚座舍利宝塔), located in the southern section of town, is a miniature temple built in Indian style, so named for the five four-sided pagodas that jut up from the rectangular base of the building. This is a pretty temple that is worth taking time out to visit, especially if you are in the vicinity of this older section of town. The pagoda is located in the southeast of Baita (bái tǎ 白塔) Village in the east suburbs about 17 kilometers (11miles) from Hohhot City. Wanbu Huayanjing Pagoda was said to be built in Emperor Shengzong's (shèng zōng 圣宗) reign (983 - 1031) of the Liao Dynasty (liáo 辽) (916 - 1125). 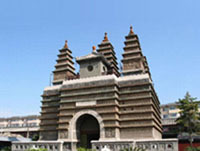 In 1982, the Wanbu Huayanjing Pagoda became a national key cultural relic site. Xilamuren, which means "yellow water" in Mongolian, is also known as Zhaohe (zhào hé 召河). Lying about ninety kilometers (about 56 miles) north of Hohhot, Xilamuren Grassland is the nearest grassland tourist attraction to Hohhot and the earliest one in Inner Mongolia. To experience the life on the grassland, you can visit herdsmen's house and have the local meal prepared by them. Visitors can ride a horse at a gallop or ride a camel at slow pace in the boundless grassland. In the evening, you can dance and sing with the locals surrounding the campfire. It will make your tour special and colorful. When it comes to 25th to 31st July every year it is the time for Nadam (nà dá mù 那达慕) Festival, which is the traditional activity in Mongolia and plays a key role in their life. 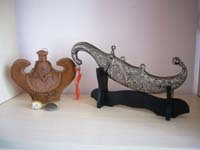 In the past, lamas always burn incense to pray to Buddha. At present, there are many different activities during the festival, such as, wrestling, horserace, archery, etc. Location: 145 km north of Hohhot. 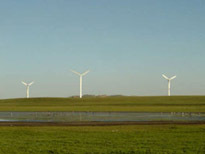 Transportation: You can take a bus along the provincial highway 102 from Hohhot to the grassland. It will take you about 2 hours. 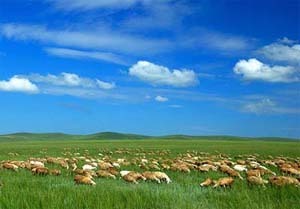 With an altitude of over 1800 meters and 100 kilometers from the east to the west, Huitengxile Grassland is located in the Qahar Right Wing Middle Banner (察哈尔右翼中旗) of Ulanqab (乌兰察布) League 135 kilometers away from Hohhot. “Huitengxile” means "cold plateau” in Mongolia. There are 99 natural lakes dotted among the vast grassland, which shows both the vigorousness and firmness of grassland and brightness and beauty of watery towns in the south of Yangtze River. The beautiful mountains and clear waters here are full of magnificent carriage. From May to September, the land is covered with green grass and flower. Volcanic lava platform constitutes the landform of the place. The land rises and falls to form various lakes at the low-lying grounds which look like sapphires inlaid in the green grassland. There are also many wonders to view. From caving in the Huanghua Gully (huáng huā gōu 黄花沟) and Heishan Mountain's (hēi shān 黑山) 99 grottoes to visiting the grassland's numerous hot springs. Huitengxile offers the usual traditional Mongolian activities on the menu, and then some. Try some hare's milk wine, or a camel ride and take in a gorgeous landscape carpeted with wildflowers in the warm months. Transportation: You can take a coach in Hohhot to the Qahar Right Wing Middle Banner of Ulanqab League, then charter a bus to the grassland. Or you can take a train to Zhuzhi Mountain, then charter a bus to the grassland. 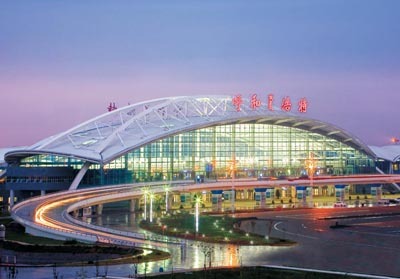 Hohhot Baita International Airport is Inner Mongolia's main airport. Located one hour outside of Hohhot, regular flights are available to Beijing, Chifeng (chì fēng 赤峰), Guangzhou (guǎng zhōu 广州), Hailar (hǎi lā ěr 海拉尔), Shanghai (shàng hǎi 上海), Shenzhen (shēn zhèn 深圳), Shijiazhuang (shí jiā zhuāng 石家庄), Wuhan (wǔ hàn 武汉), Xi'an (xī ān 西安), and Xilinhot (xī lín hào tè 锡林浩特). International flight are available to Ulaanbaatar (wū lán bā tuō 乌兰巴托), Mongolia. Hohhot is connected to the following cities by rail: Baotou (2 hours), Beijing (11 hours), Datong (dà tóng 大同) (5 hours), Erenhot (èr lián hào tè 二连浩特) (11 hours), Yinchuan (yín chuān 银川) (10 hours), Moscow and Ulaanbaatar. The Beijing to Hohhot overnight train is K89. K89 departs at 21:00 and arrives at 07:20. The K90 from Hohhot to Beijing departs at 21:23 and arrives at 07:20 (cost is ~ USD$24 for a hard sleeper). Trains 4652 and 4653 run between Hohhot and Erenhot. The train leaving from Hohhot departs at 22:00 and arrives at 06:08 (cost is between ~ USD$11 for a hard sleeper). The long distance bus station is located next to main train station. There are regular bus services to the following cities: Baotou (2 hours), Beijing (8-11 hours), Datong (4 hours), and Dongsheng (dōng shèng 东胜) (3 hours). Taxis start at ¥ 6 during the day (¥ 7.50 at night) and are highly available throughout the day. Taxis become more difficult to flag down at 2:00-3:00 PM when people go back to work as well as during early evening, or with foul weather. Buses run until 8:30 PM during the winter. Bicycles are by far the most convenient and common in the city. Be careful with the new/foreign traffic patterns. Left turns occur after straight traffic, typically bicycles turn left from the bicycle lane with auto traffic through intersections. Following local traffic is often the safest way to ride and will orient you to traffic patterns, customs, and flow. During peak hours, traffic police will dictate crossing times. Parking your bicycle is easy and convenient in the 'corral' spaces. Attendants will issue you and your bicycle matching 'sticks' and your bicycle will be generally safe while you shop or go to work. Rates are ¥ 0.5-2/day. Hours may vary. Depending on construction levels, walking the city is very easy and common and is perhaps the best way to interact with locals. During peak hours, traffic police will dictate crossing times. Theft and molestation is generally not high in the city, however prudence should always be practiced. As a city spectacle, a smile will often turn obvious bewilderment of the passing people into delight. Try it out! ¥ 0.5-1 is a reasonable amount to offer beggars and the homeless, as well as empty plastic bottles.